Drivers in the market for their next vehicle know just how challenging it can be to find the perfect fit. Whether you’re looking for a full-size SUV or a fuel-efficient sedan, the process of narrowing down between the makes and models is definitely sure to be time consuming. Our team here at Certified Autoplex is trying to find ways to make the car shopping process easier for everyone by providing some details about the vehicles we carry here on our lot in Carrollton, TX. We only carry used vehicles. Our specialty is with used luxury vehicles, but we have quite a few mainstream makes and models as well. 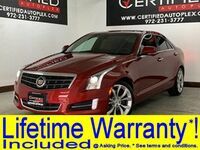 One popular choice on our lot is a used Cadillac ATS. This vehicle is the most affordable sedan on the Cadillac lineup, but that doesn’t make it any less impressive than the rest of this luxury lineup. Sedans are one of the most practical models a driver can choose from because they’re usually affordable, comfortable and efficient. The Cadillac brand accounts for about ten percent of our entire inventory here at Certified Autoplex, which means we have quite a few models for drivers to choose from. It’s important to keep in mind that our inventory is constantly changing, but as of now we have three 2013 models and one 2014 model for the Cadillac ATS. Some available features include heated seats, rearview cameras and Bose Premium sound systems as well as keyless entry and navigation systems. 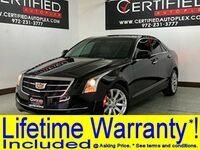 All three of the 2013 Cadillac ATS models are set with a lifetime warranty for peace-of-mind years down the road after you make the purchase with us here at Certified Autoplex. When it comes to performance, there are few different engine options for these models. Two of them are set with a 2.0-liter Turbo I-4 engine, which gets an average 21 mpg in the city and 31 on the highway. The other two are slightly more efficient with a 2.5-liter I-4 engine that averages 22 mpg in the city and 33 on the highway. Drivers interested in learning more about what the Cadillac ATS sedan has to offer are welcome to contact our team here at Certified Autoplex for more information. Those looking to get behind the wheel can do so by scheduling a test drive online. Interested in a Used Cadillac ATS?